Glen Moray Launches Fired Oak Cask 10-year-old Single Malt! 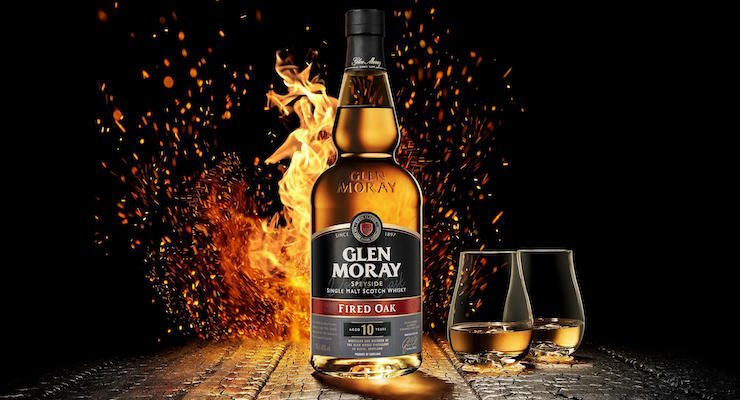 The team at Glen Moray Single Malt Whisky is excited to be launching Glen Moray Fired Oak 10- Year-Old Single Malt Whisky this November as they continue to develop their ‘Gateway to Flavour’ by adding a bold new expression which is intensely sweet and smooth. The attention to detail is imperative. Graham Coull has worked closely with the distillery’s cooperage to source the finest new American Oak barrels for finishing, as the consistency and security of the supply of casks is very important. Graham then selects the precise firing regime to achieve exactly the right level of char to impart intense flavour and colour to the whisky. As Glen Moray’s wood finished expressions are growing in popularity, Graham is working at least two years ahead to ensure that the distillery can satisfy the growth in demand. Fired Oak is all about enhancing flavours rather than adding different character. The Virgin Oak intensifies the existing vanilla and spice flavours which have come from the ex-Bourbon barrels. Two elements are key – quality of cask and timing, both are crucial to obtaining just the right flavour infusion. To create a balance I have selected Virgin Oak casks with differing lengths of finish to ensure that the final whisky is consistent. Over the final maturation period, the spirit slowly changes, the colour deepens and the taste profile takes on intense notes of vanilla sweetness and smokiness from the oak. Only when it reaches its peak, after 10 months, is it ready to be bottled and enjoyed. Developing this whisky was akin to blowing gently on the embers of a bonfire to bring the flames back to life. Available soon from: The Whisky Exchange, Master of Malt, Royal Mile Whiskies, Scotch Whisky Experience, Gordon Macphail, Good Spirits Company and all good whisky specialist retailers. Nose: A sweet shop in a glass. Barley sugars, pineapple chunks and butter toffee. Taste: Blackcurrant jam and chewy liquorice toffee. Pleasantly sweet and spicy with layers of vanilla bark. This whisky is sweeter than the other single malts in Glen Moray’s collection. Finish: Dark chocolate dissolves over the tongue and fades revealing a hint of smokiness and toasted vanilla. The Walsh Whiskey Tweet Tasting – Chocolate, Tropical Fruit & Spice – Who Could Ask For More?! Irish Whiskey, namely from the Walsh Whiskey Distillery was the subject of last Monday nights @TweetTastings hosted by Steve from The Whisky Wire. Walsh Whiskey was founded in 1999, initially to create a better Irish Coffee and eventually leading to re-creating a Whiskey recipe to celebrate the golden era of 19th. century distilling in Ireland. They rapidly became a leading player in the revival of Irish Whiskey. Since then, Walsh Whiskey, have gone from strength to strength. They officially opened their €25 million distillery at Royal Oak, County Carlow, Ireland in June 2016. The distillery produces all three styles of Irish whiskey; pot still, malt and grain from its two production lines using both pot stills and column stills. The Walsh Whiskey Distillery is one of the largest in Ireland, with the capacity to produce 8.2 million bottles of whiskey a year. 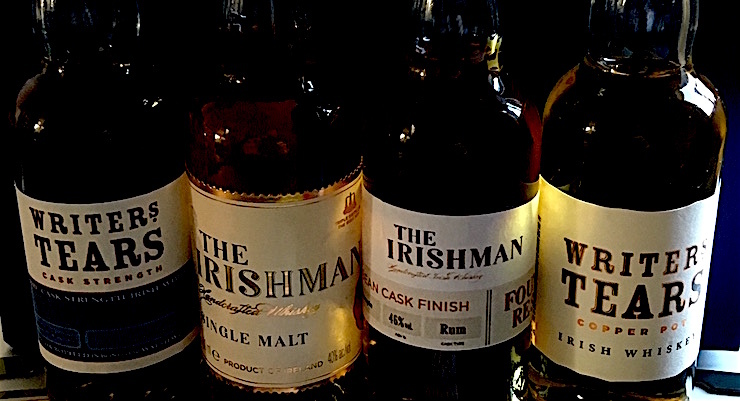 Walsh Whiskey’s The Irishman and Writers Tears brands are currently sold in over 45 countries. By 2019 this will have increased to over 100! If you want to catch up on what all the tweet tasters had to say you can view the tweets by searching for the hash tag #WalshWhiskey on Twitter. Here are my tasting notes … and the one which was my favourite on the night! A blend of single malt and single pot still whiskeys; 60% malt & 40% pot still. Triple distilled, non-peated and matured in American oak bourbon casks. A gold Medal winner at the International Spirits Challenge in London and one of the highest rated Irish Whiskeys in Jim Murray’s Iconic “Whiskey Bible”. “Altogether a very unusual Irish Whiskey , a throwback to the last century where spiced Pure Pot Still whiskey was married with Floral Single Malt” – Jim Murray. It has also been added to Ian Buxton’s publication “101 Whiskeys to try before you die”. Nose: Apples with some sugary vanilla. Quite floral with some oatiness thrown in. Very definite mintiness coming through with a little toffee and some spicy cinnamon. Palate: Smooth and light with apples and floral flavours. Creamy vanilla custard with a smidge of mint! Finish: Spice oils and oak balanced with fruity sweetness and a dry kick at the end. Overall: A great whiskey with plenty of nosing aromas and flavour. Matured in a combination of bourbon barrels and Oloroso sherry butts. Triple distilled, it won Whiskey of the Year and Overall Spirit of the Year at the London Spirits Competition 2018. Nose: Crisp apples and malty oatcake biscuits – very nice! Sherry and a hint of those famous bananas the tweeters are talking about! After a while I’m getting a little tropical fruits with some fudge. Palate: Luscious sweet fruits with some chocolate plus hints of cereal and grapefruit. Finish: A fiery end with some tanin dryness and cereal – punchy, but in a good way! Overall: Spicy and sweet with impressive fruit aromas and flavours. Produced using the original signature blend created by distillery founder Bernard Walsh, which is comprised of 70% Single Malt and 30% Single Pot Still. Finished for 6 months in The Chairman’s Reserve rum casks from the Caribbean island of St. Lucia. Winner of Best Irish Single Cask of the Year at the Irish Whiskey Awards 2018. Nose: Rum soaked wood and plump raisins – lovely! Very fruity with apples and a tropical cocktail but this dram takes a while to develop … vanilla fudge comes through as a finale. Palate: Rich and sweet with LOADS of tropical fruits and apples. Only a hint of rum for me I’m afraid but it’s incredibly tasty all the same! Finish: Some peppery spice that duels with the fruity sweetness admirably. I also got a real burst of yummy dark chocolate right at the end! Overall: Not as rummy as I expected (and hoped for) but this is more than made up for in some great tropical fruits flavours and warming spice! As an experiment, my fellow tweeters and I paired this up with some dark chocolate – an experience I’d highly recommend – chocolate alcohol heaven! Are we allowed to have so much fun on a Monday night?! A rare vatting of aged Single Pot Still and Single Malt Whiskey’s. Triple distilled and matured in bourbon barrels and limited to just 5,175 bottles. Cask Strength was a Gold Medal winner in “The Premium Irish Whiskey Category” at The Whiskey Masters. Palate: WoW! A chocolate and tropical fruit spicy hit! Creamy chocolate and tropical fruitiness. Finish: Adding H2O smooths things out a lot – there’s chocolate, apples and vanilla with a punchy spice that not even water can tame! Overall: Chocolate, tropical fruit and a spicy conclusion. What is there NOT to like? Very enjoyable indeed and if you add some water you can enjoy it all over again! Out of the 4, I think it’s got to be the Writers Tears Cask Strength followed closely by The Irishman Founder’s Reserve Caribbean Rum Finish. The Cask Strength has such lovely chocolate flavours and two individual palates when you dram it neat or with water – double your fun and gorgeous with it! Many thanks to Steve at The Whisky Wire (@TheWhiskyWire) for a great sampling evening and the team at Walsh Whiskey (@WalshWhiskey) for sending the samples and without whom! 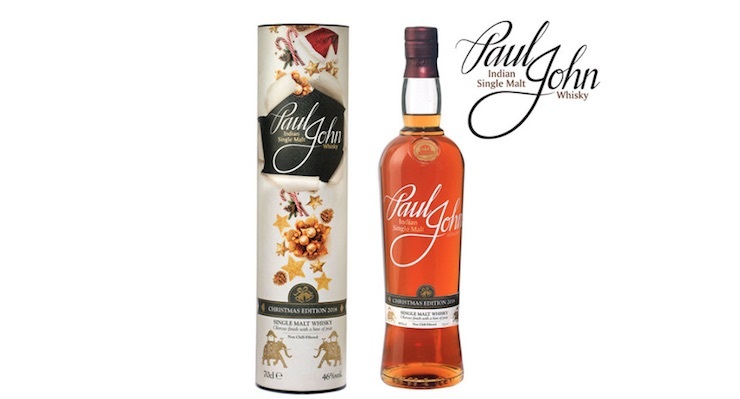 2018 Christmas Edition From Paul John Whisky – New Arrivals From Edencroft! Paul John / Mars Orbiter. STATED AGE: 4 Years Old. An interplanetary quest for knowledge, pride and discovery, and completing a marathon of 670 million kilometers in 300 days, the Mars Orbiter Mission stands forever as a symbol of national prestige. As the first Asian country to reach the Martian orbit, and the only nation to successfully do so at the very first attempt, India made her mark on the space frontier with this ambitious project. History was made that day, an immortal moment for every Indian – the day we went to Mars. Such an achievement deserves to be marked with something equally remarkable. Which is why Paul John chose to pay our homage with a limited edition single malt that is worthy of its name: Mars Orbiter. Drawn on the same month that the Indian space probe was launched, this rare edition is a tribute to the brilliance and efforts that made this tremendous mission successful. From the tropical paradise of Goa, Mars Orbiter proffers intense and dramatic aromas of peat tinged with orange peel and a sweet barley. The palate is then refreshed with gentle spice, tinged with hints of bitter chocolate. Glide into orbit with a deep and graceful finish of spiced butterscotch and profound peat that leaves you yearning for more. TASTING NOTES: Aromas of honeyed orange blossom with a dash of Muscovado sugar tinged with smoked bacon and delicious peat. 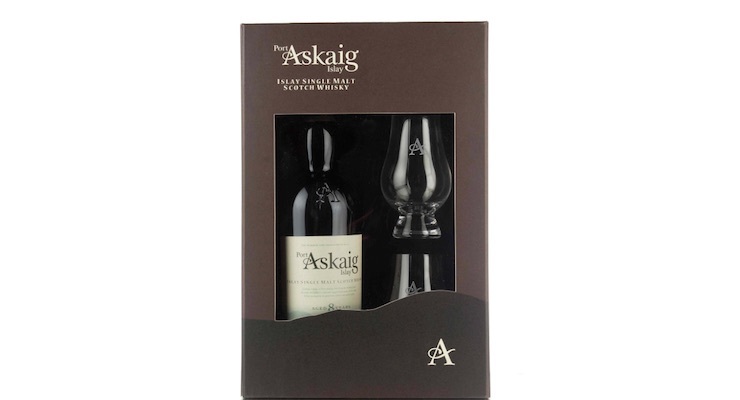 On the palate the whisky is smooth and malty with flavours of dark cocoa, salted almonds and a sweet oak. The finish is long and delightfully spicy with a toasted sugar laced with gorgeous tannic smokiness. Johnnie Walker / Blue Label Year of the Pig. BOTTLING SERIE: Chinese New Year. The Glasgow Distillery Co. / 1770 Whisky Release No.1. DISTILLERY: The Glasgow Distillery Co.
BOTTLING SERIE: Release No. 1. CASK TYPE: 1st fill Bourbon, Virgin oak finish. TO THE EYE: A vibrant golden glow. TO THE MOUTH: Refreshing and warming all at once. TO THE NOSE: Pears and rhubarb, with hot custard and a sprinkling of pepper. TO THE END: A lingering peppery spice, yet sweet finish. Caperdonich / 26 Year Old Hunter Laing Old & Rare. BOTTLING SERIE: Old & Rare. Macallan / 25 Year Old Sherry Oak. CASK TYPE: Sherry Seasoned Oak Casks from Jerez. PALATE: Full and rich, with dried fruits and a hint of wood smoke. FINISH: Long, with dried fruit, wood smoke and spice. It’s The Gift Set Season! New Arrivals From Abbey Whisky! Whisky.auction – Battling Plastic Pollution With It’s Whisky For Oceans Auction – Ends Soon! 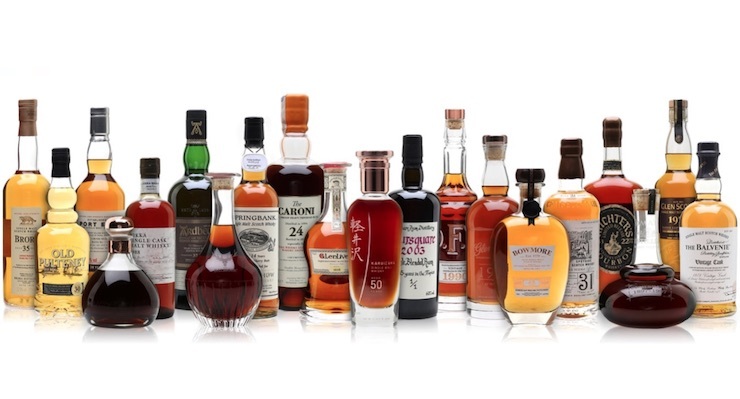 Online spirits auctioneer, whisky.auction, is nearing the end of hosting it’s public sale of the most impressive selection of one-off bottles of whisky and rum ever to come to auction. The auction is expected to raise upwards of £200,000 for non-profit organisations around the world dedicated to battling the impact of single-use plastic waste, including US-based Plastic Oceans International. The exceptional collection of bottles were on show at The Whisky Show in London where the show’s creator, The Whisky Exchange, is actively eliminating single-use plastic from the show. The selection of bottles were curated in partnership with The Whisky Exchange to mark the 10th edition of The Whisky Show and celebrate the show’s move towards plastic-free. The auction has 11 out of 20 lots already confirmed as one-off bottles never to be repeated. Sensational whiskies from distilleries across Scotland sit alongside a magnum of the legendary Caroni rum from Trinidad and a 50 year old whisky from Japan’s highly sought-after Karuizawa distillery – one of the oldest ever releases from this iconic producer. This lot is currently attracting the Highest Bid! The Balvenie 1973 Vintage Cask. Bottle number 1 of 1. A limited edition single malt Scotch whisky, bottled from a single cask from a single vintage. Ardbeg 37 Year Old. Bottle number 1 of 1. A stunning whisky, and one of the only one-off bottlings Ardbeg have ever produced in their history. Brora 35 Year Old. Bottle number 1 of 1. A cult closed distillery that has rarely released a single cask bottling, let alone 1 of 1. Karuizawa 50 Year Old. Bottle number 1 of 2. From closed Japanese distillery Karuizawa and has the potential to set a new auction record for Japanese whisky. O.F.C 1990. One of only 63 bottles and the first to ever arrive in the UK. With so many of these entirely unique bottles never to be repeated, it is expected that the auction could fetch upwards of £200,000. Higher estimates predict the auction could reach over £300,000, with the possibility of the Karuizawa alone could raising as much as £200,000 and potentially setting a record for the most expensive Japanese whisky ever sold. The auction ends on 27th November 2018. All profits from the auction will be used by chosen charities to actively combat the ongoing plight of the world’s oceans. For example US-based non-profit organisation Plastic Oceans will use their donation to expand global awareness initiatives, with a goal of reaching another billion people by 2020. The funds will be utilised to develop films and other content that will target school children, policy awareness, and consumer behaviour – all with the goal of educating, inspiring, and fostering change. Every now and then an auction line-up comes along that has spirits collectors and connoisseurs on the edge of their seats with excitement. This is one of those auctions. These bottles are not merely rare, some of them are entirely unique; they have never been seen before and may never be seen again. The distilleries and bottlers who have kindly created and donated these lots fully support the work that charities like Plastic Oceans undertakes and were committed to helping us raise as much money as possible for this cause. It is difficult to put into words just how remarkable these bottles are, and we’re really hoping that is reflected in their final hammer prices. We are honoured to be a beneficiary of the auction and very excited to see the programmes being implemented by the organisers to reduce their single-use plastic footprint at their events. It’s yet another example of an industry recognising the problem and being part of the solution. The most legendary and sought-after of all the closed distilleries. Port Ellen is no longer part of the Diageo annual Special Releases so to not only have this donated in Special Releases packaging, but as a 1 of 1 is simply exceptional. Macallan remains by some distance the no.1 most sought-after, collectable and investable whisky in the world and this is regarded as the best Macallan ever bottled. The biggest cult following of all the Scottish distilleries. This is a stunning whisky, and one of the only one-off bottlings Ardbeg have ever produced in their history. It has been bottled in a unique vintage packaging. Incredibly sought-after whisky, especially from this era of Bowmore. One of the top 3 most collectable Scottish distilleries along with Macallan and Dalmore. Dalmore is on fire and is the most collectable Scottish whisky after Macallan. Unlike their wider 45 year old release, this one-off bottle is from a single sherry cask with a colour so dark it is almost black. Another cult closed distillery that has rarely released a single cask bottling, let alone a 1 of 1 release such as this. This takes the rarity of Brora to the next level. From the golden age of the early 1970s which many consider to have produced the greatest whiskies ever. Balvenie has a huge following worldwide, and is probably the fastest growing distillery in terms of collectability and demand. They have very little stock of this age so to get this one-off is a real treat. A truly unique 1 of 1 release, packaged in an engraved crystal bottle. Another cult distillery who rarely release single casks let alone a one-off bottle. This single bottle was specially selected by the Springbank team from one of their favourite casks and will never be repeated. This distillery exclusive has never been sold outside of the walls of Yoichi. Yoichi was voted as the world’s best whisky at the World Whisky Awards as early as 2001 and led the way in the dramatic ascension of Japanese whisky’s reputation. One of the very oldest vintages of Glenlivet on the market. A rare privilege to present such a whisky from one of the most famous of all Scotland’s distilleries. This bottle of O.F.C 1990 vintage bourbon comes from a barrel that had been maturing for almost 30 years at what is now the Buffalo Trace Distillery. It is one of only 63 bottles and has never been sold commercially. This is its first time a bottle of this whiskey has ever landed on UK shores. The world’s greatest rum bottler, Velier, brings us the oldest Caroni rum in existence that is still ageing in cask. The tropical ageing results in a loss of 6-8% per year so this rum is much much rarer and more mature than a Scotch whisky of the same age would be. Foursquare is currently the hottest producer in the rum market. New releases sell out immediately and are usually sold on allocation due to such exceptional demand. The secret to Craigellachie’s vibrancy lies in being one of the last remaining Scottish distilleries to use coiling copper worm tub condensers, it gives the spirited whisky its meaty, ample mouthfeel. Such a labour of love is commendable, so much so, that this 2016 batch of Craigellachie 31 Year Old scored an impressive 90 points on Whiskyfun, was voted World’s Best Single Malt at the 2017 World Whisky Awards, and, understandably, sold out in a flash. Campbeltown’s tumultuous history, coupled with frequent changes in ownership and intermittent closures, mean there is precious little old stock. Distilled in 1973, this is bottle number 1 of 1 of what is quite possibly the oldest Glen Scotia ever bottled. Inspired by America’s first distillers, this Kentucky straight bourbon was distilled from native corn and aged 22 years in hand-selected charred white oak barrels. This is bottle number 1 of 1 from Batch number 18K1646. This still-shaped decanter of 30 year old sherry aged Tomatin is one of 1000 originally released in 1997, the crown jewel in celebrations of the distillery’s first, and highly successful, century of single malt whisky production. This bottle of Old Pulteney 30 Year Old was matured in ex-bourbon American oak casks and bottled without added colour or chill-filtration. This is a 75cl bottle and was released for the US market. Billy Leighton Joins The Whisky Magazine Hall Of Fame! 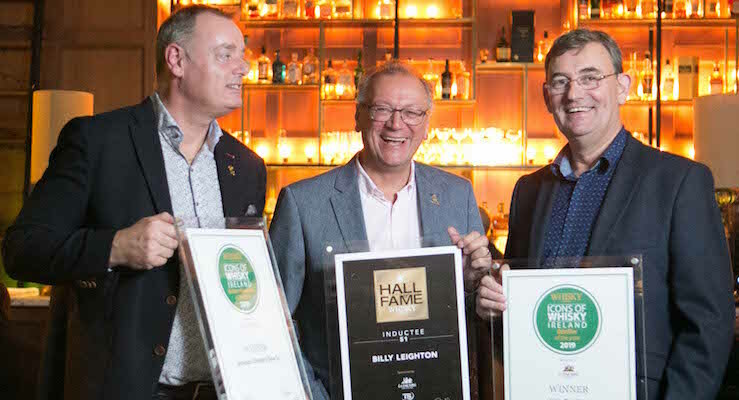 Billy Leighton, Master Blender at Midleton distillery, has been inducted into the Whisky Magazine Hall of Fame in a special ceremony at The Dean Hotel, Dublin. Billy was bestowed the great honour in recognition of his 42 years in the industry and contribution to the growth of the Irish whiskey category with Irish Distillers. The Icons of Whiskey Ireland aim to recognise the diversity and passion within the Irish whiskey industry today. Billy Leighton is an Irish whiskey legend. His contribution to the revival of single pot still whiskey has re-shaped the Irish whiskey landscape and whiskey fans around the world owe him a debt of gratitude. 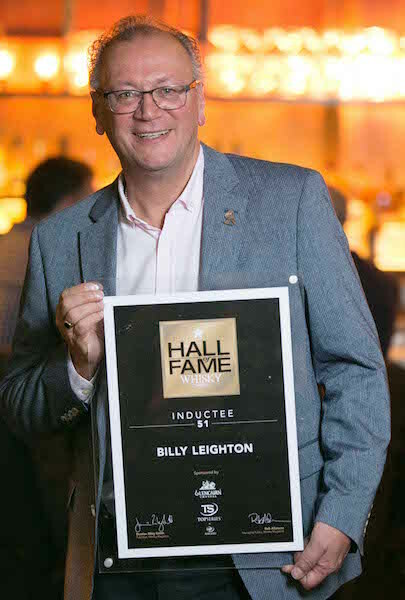 On behalf of Whisky Magazine, I’m delighted to welcome Billy into the Hall of Fame and look forward to seeing what he’s got up his sleeve next. With almost a decade of experience as Master Blender behind him, Billy has diligently managed the mature stocks of Irish whiskey at Midleton Distillery in Co. Cork and used his logistical nous to forecast future demands. Some of Billy’s finest triumphs have come in the past 10 years with the revival of the much-loved Redbreast whiskey amongst his greatest achievements. The launch of Redbreast Dream Cask in May 2018 has arguably been the crowning glory of his work with Ireland’s most famous single pot still whiskey and will be remembered as Billy’s dream whiskey. I’m deeply honoured to join the pantheon of whiskey greats in the Whisky Magazine Hall of Fame, not least an old mentor of mine, Barry Crockett. It has been a pleasure to watch Irish whiskey regain its rightful place amongst the world’s leading spirits and I hope I’ve been able to make a contribution to this. Finally, I must thank the rest of the production team, past and present, whose dedication to craft and excellence has supported in the creation of some of the finest Irish whiskeys of all time, it’s been a pleasure and I look forward to what we can conjure up next. It is a pleasure to offer my congratulations to Billy Leighton upon his induction to the Whisky Magazine Hall of Fame – he has been a true inspiration to Irish Distillers and the wider whiskey world over the course of his many years of dedicated service. His commitment to crafting whiskey that is worthy of revitalising the category has inspired a whole new generation with Irish whiskey and for this we will be forever grateful. We doth our cap to Billy and raise a glass in tribute to our Master Blender. Irish Distillers was also honoured with a number of top accolades including Visitor Attraction of the Year and Irish Whiskey Producer of the year. The Whisky Exchange Black Friday Whisky 2018 – Stay Cosy & Buy A Dram Online! It’s An Orkney 18 Year Old! NOW Available! 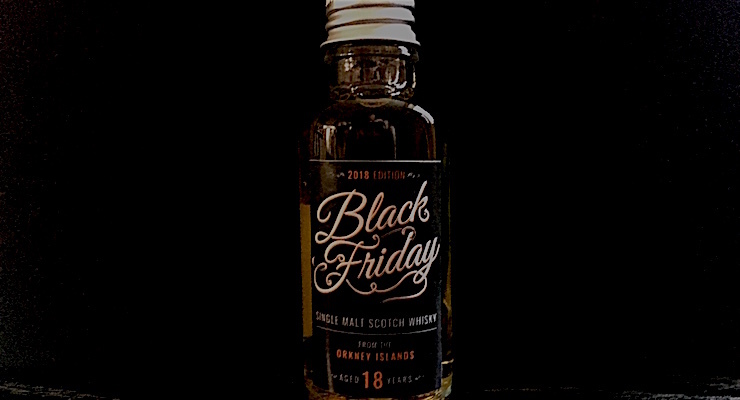 The Whisky Exchange Black Friday Whisky 2018: An Orkney 18 Year Old! Now a firm tradition at The Whisky Exchange, their limited-edition Black Friday Whisky is now on sale! Last year’s limited-edition Black Friday Malt sold out in 20 minutes flat! A one-off single malt that has been bottled exclusively for The Whisky Exchange by Elixir Distillers from an unnamed Orkney distillery. There are only 1400 bottles available and a 70cl. bottle is priced at £69.95. If it’s anything like previous years this dram won’t last long (last year’s limited-edition Black Friday Malt sold out in 20 minutes flat!) so you need to be quick if you want to catch this. Nose: Sweet sherry hit with red apples. There’s a little smoke (just a hint), dark chocolate, spicy fruits and aromas of rain soaked undergrowth. After a while there’s creamy vanilla caramels. Finish: Fiery pepper with a fiesty dark kick that warms the cockles! It’s held in check by some chocolate orange sweetness. A dry tobacco finish with a pinch of salt tops the whole thing off. Overall: Now this is a black friday deal I can get behind! It may not be reduced to a ridiculous price but you do have the opportunity to get hold of a classy limited edition dram – certainly a bargain in itself! So Stay Cosy This Black Friday – Buy A Dram Online! The Whisky Advent Calendar Tweet Tasting! The Whisky Red Advent Calendar! Christmas was certainly in the air (and in the nose!) for last Monday nights Tweet Tastings making us all realise that Chrimbo was only a roasted chestnut throw away! We were treated to the delight of sampling five drams from Master of Malt’s Whisky Red Advent Calendar (£149.95). It was a great (and early) introduction to the festive season! 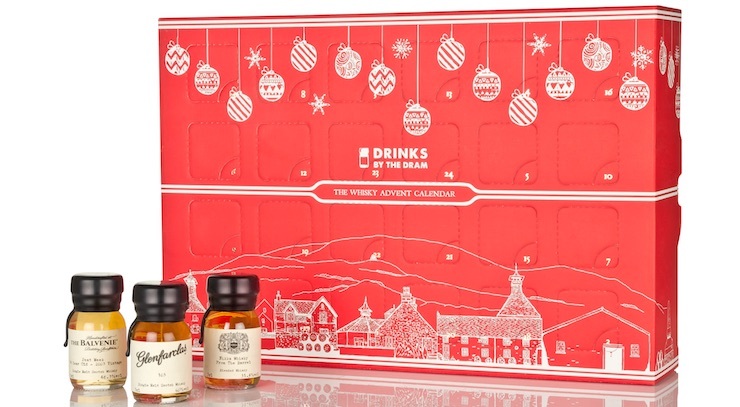 Master of Malt’s Advent Calendars are now as traditional as listening to Christmas classic Pop Songs or over-cooking the sprouts so it’s great to have a chance to try out some whiskies which hail from all over the globe – a Whisky Red World Advent Calendar in fact! If you want to catch up on what all the tweet tasters had to say you can view the tweets by searching for the hash tag #WhiskyAdvent on Twitter. An Australian Malt Whisky Produced using 100% Australian malted barley and aged in Australian Apera (fortified wine) casks. Nose: Apples, oranges and yummy caramel with a hint of rum soaked plump raisins. Add a little bit of woodiness and some nice creamy fudginess which comes thru after a while! Palate: Rich christmas cake with alcohol infused fruits! Some apples, oranges & tropical fruit with a hefty bit of spice thrown in. Finish: Quite a dry, spicy finish but fair-dinkum all the same. Overall: A solid, tasty dram that I enjoyed very much and would love to re-visit! A French Single Malt Whisky Produced using malted barley grown in Cognac. Initially matured in Limousin oak casks before being finished in Cognac casks. Nose: Amazing tropical fruits – reminds me of those tuiti-fruiti chewy sweets! Plus there’s apples and pears with sugary vanilla. The banofee pie is also strong in this one with a side-serving of Rum and raisin ice cream. Palate: A watered down version of the nose – banana and strawberry milkshake with a little too much sugar. An Irish Single Malt Whiskey – Whiskey #1 – Aged 13 Years – Batch #3. Nose: Restrained sherry with some crisp green apples, fruits, caramel coupled with some fresh new wood. There’s oat and cereal with a little meadow hay. Left in the glass, after a while, there’s sticky toffee! Palate: Yo! That’s nice! Vanilla sweet and fruity with a smooth, punchy, peppery bite! Finish: Tropical fruit coupled with a woody dryness and don’t forget that spice! Overall: I’m not surprised I enjoyed this – another fine, well selected and tasty dram from the Boutiquey Whisky stable! Kavalan Single Malt is a Taiwanese non-age-stated Whisky. Matured in ex-bourbon barrels it is rumoured to be around 3-4 years old. Nose: Crisp apples with some ripe tangerines and pineapple. Vanilla fudge and I keep getting whiffs of Cointreau! – there’s so much oranginess! Palate: Syrupy tropical fruits with some caramel – lovely! Finish: Honeyed layers of fruit with just a dash of spiceiness that make this a very nice dram indeed! Overall: First time sampling the Kavalan brand and I wasn’t dissapointed – amazing flavours and balance for such a young whisky. A Single Malt Scotch Whisky. The Glenfarclas 105 bottling was the first time a distillery had released a barrel proof single malt whisky. The brand was eventually re-named to 105, referring to its alcohol content in British Proof, which equates now to 60% ABV. Nose: Creamy sherry with just a hint of port. Chocolate with stewed fruits. Palate: Rich christmas cake with luscious chocolate! Thick, creamy fudge with fruit! Adding a few drops of water releases a lot more caramel and chocolate and sets the taste buds tingling! Heady stuff though at an un-diluted 60%! Finish: Basically the same as the initial palate. This dram just keeps on giving! Out of the 5, I think it’s got to be the Glenfarclas 105, closely followed by That-Boutique-Y-Whisky. The Glenfarclas 105 is what Christmas is all about – but liquified! There’s still time to grab an Advent Calendar and they cover a variety of whiskies and other spirits including Gin, Tequila and Rum. Why not celebrate the run up to Santa’s upcoming visit with something tasty and different each day? But keep them away from those Elves! Many thanks to Steve at The Whisky Wire (@TheWhiskyWire) for a great dram evening and the team at Drinks By The Dram (@DrinksByTheDram) for sending the samples and without whom! 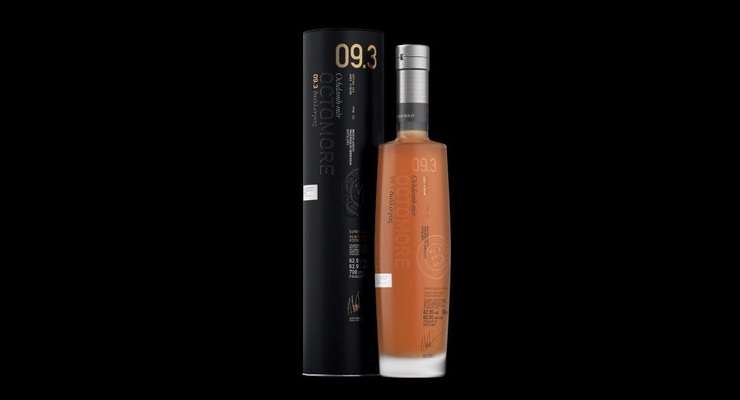 Octomore “Islay Barley 9.3” & More New Arrivals From Edencroft! Just 52 tonnes of precious Islay barley were malted to produce this single farm Octomore 09.3 edition. Raised in Irene’s Field on Octomore Farm in 2011, this uber-provenance single malt was later distilled and filled into 134 casks. Predominantly second-fill, the gentler influence of the wood allows more of the locally grown barley flavours to cut through the legendary peat smoke. In celebration of this work, four new editions marked with the tell-tale διÎ¬λογος will be released over 6 months, each a sensorial exploration of knowledge gained. It has long been part of our inherent values to allow nature to play its rightful role in our whisky. Since the early days of resurrection, our distillery has driven forward one idea, to reconnect the land, its raw materials and the people who gave them life.Deliberately taming the cask influence in this release of Octomore Islay Barley, we are allowed to taste the effect of difficult growing conditions. While little desk research has gone into understanding the flavour profile of a ‘stressed’ barley, it is widely accepted in the wine world that the timing and level of stress placed on grapes will produce a lower yield but a more flavourful fruit. Could this be applicable to whisky too? AROMA: Malted barley, Horlicks, the smell of the mash going into the mashtun. Heather wildfire, black tea, golden syrup, lemon sponge. TASTE: Golden syrup in the tin, smoked tea, wort, malted barley, pear, peach melba. Sea spray, heather flowers. FINISH: Smoke, toasted oak, rye bread, salt, ozone. CHARACTER: Wild, Ileach, if this whisky could speak it would only speak in Gaelic. Atlantic coast raised. Out on the edge, the sense of place is strong. BOTTLING SERIE: Kentucky Straight Bourbon Whiskey. Late in the 18th century, Master Distiller Basil Hayden Sr. left his Maryland home for the greener pastures of Kentucky, bringing his family and reputation with him. Not yet privy to the old guard’s ‘rules’ of bourbon, legend has it that Basil set out to make a batch simply using the ingredients he had on hand, unaware of what the traditionalists might think of his mash. What resulted was a bourbon with a uniquely high-rye mashbill, combining the sweetness of corn with the spicy undertones of rye. The purists may have been displeased, but not the neighbors who tried it. Over 200 years later, the Noe family pays tribute to Basil’s masterful discovery with a high-rye, small batch bourbon that embodies the spirit of that very first recipe. AROMA: Spice, tea, hint of peppermint. TASTE: Spicy, light-bodied, gentle bite. The signature Bourbon bearing the name of Rev. Elijah Craig, a Bourbon pioneer who is credited with being the first distiller to age his whiskey in charred oak barrels. Long before the term Small Batch even existed, our Master Distillers were hand-selecting just the right number of barrels to make Elijah Craig. This expertise and attention to detail give Elijah Craig Small Batch the right balance of rich flavour and full body. Each small batch carries a signature warm spice and subtle smoke flavour. A combination that belongs in any Bourbon fan’s regular rotation. TASTE: Smooth and warm; pleasantly woody with accents of spice, smoke, and nutmeg. FINISH: Long, sweet, and slightly toasty. Bruichladdich / 2006Â Burgundy Cask. Waterford Distillery Appoints It’s Very Own ‘Terroir Agronomist’ – Grace O’Reilly! Waterford Distillery, the Irish single malt whisky producer, is delighted to announce that Grace O’Reilly will be joining the team as the company’s agronomist in charge of terroir. 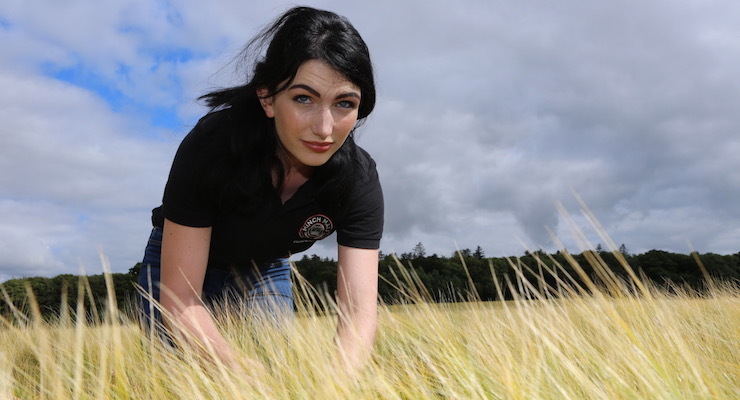 Grace will be overseeing the distillery’s relationship with its barley growers, and deepening the company’s understanding of the barley grown across their multiple Irish terroirs. Terroir is the French word used primarily in the wine trade to describe the interaction between soil, microclimate and place. Grace will help unearth knowledge on how these variables influence the different flavours found in the terroir-derived distillates produced at Waterford Distillery. Grace’s career started with the Minch Malt, part of maltsters Boortmalt, and was from day one closely involved with the distillery’s initial intricate barley logistics. Latterly Grace was with agricultural specialists Glanbia, before joining Waterford Distillery directly. She has continued to advise malting barley growers over the past four harvests across Ireland’s tillage-growing regions. Having witnessed first-hand the successes and challenges of localized barley production across Ireland, Grace has a profound understanding of the variance from eld to eld in a given growing season. Terroir, provenance and traceability may be trendy buzzwords frequently bandied about by marketing men, but to us they actually mean something. Heretical as it may seem, we can show that a whisky’s flavour can indeed be influenced by where its barley is grown. While large distillers understandably are reluctant to accept this inconvenience, we find it both compelling and intriguing. Grace’s appointment is a kind of ‘putting money where our mouth is’ thing. From the beginning I really enjoyed collaborating with the team at Waterford Distillery and I’m thrilled to be joining at this exciting stage. Waterford Distillery are leaders in a what I hope becomes a barley movement. The level of research and data that has been collected on the 71 farms so-far involved is astonishing, and proves how serious we are about terroir. Growers are the gatekeepers of terroir and through the spirit we can see how all these factors can in influence flavour. 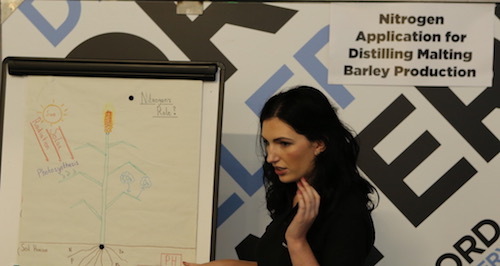 It is highly unusual for a whisky distillery to require its own in-house agronomist, but is indicative of the importance attributable to the extensive barley provisioning policy and the consequent understanding of terroir. Given Waterford Distillery’s obsession with barley – the essential variable that makes single malt whisky the most complex spirit in the world – the team believes this appointment will further enhance the company’s pioneering exploration in to whisky terroir.